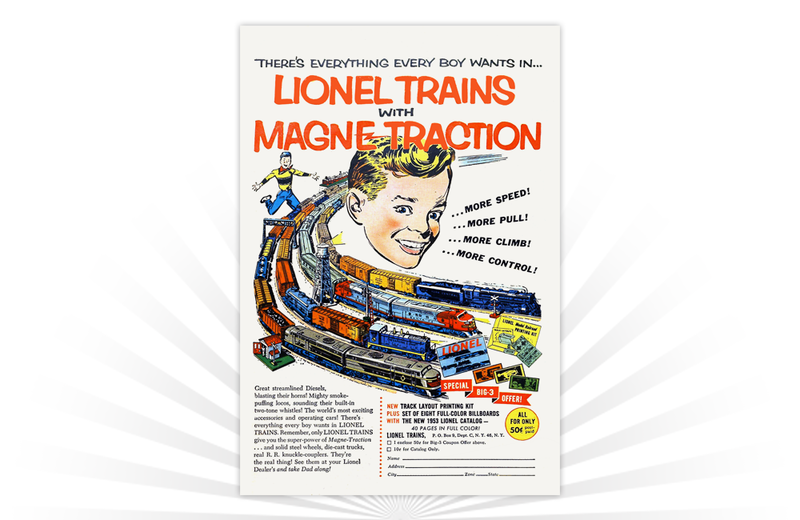 A vintage ad from 1954 for Lionel Trains with Magne-Traction. Locomotives equipped with Magne-Traction had driving wheels that were magnetized through the insertion of Alnico magnets in the driving axles. This feature allowed the locomotive to grip steel tracks more tightly, pull heavier loads, and climb steeper grades without slipping. Kenner's 1973 advertisement for the Give-A-Show Projector promoted new entertainment options for the toy's 14th anniversary. Paying homage to the space-faring exploits of sci-fi fan-favorite Buck Rogers, Norton-Honer released an official Sonic Ray Gun in the 1950s.